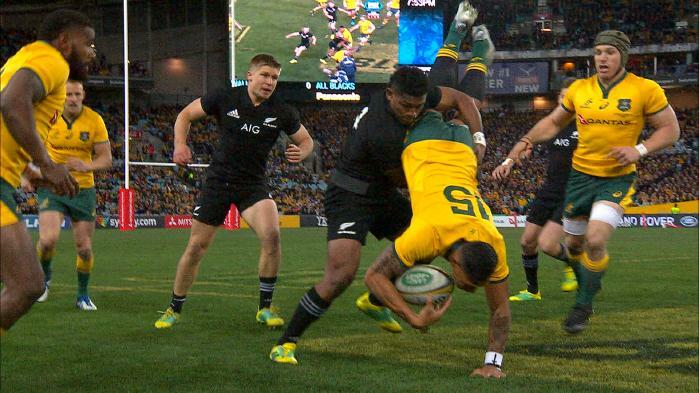 The All Blacks are on course to go one-nil up in their Bledisloe Cup clash with Australia in Sydney, but things could have been a whole lot different had referee Jaco Peyper punished Waisake Naholo for this dangerous tackle. With just four minutes on the clock, Naholo clearly lifted Wallaby Israel Folau above the horizontal, with the fullback saving himself from serious injury by cushioning his fall with an outstretched arm. But South African referee Jaco Peyper and his assistants came to the conclusion that it only merited a penalty, despite the protestations of Wallabies captain Michael Hooper. Is it another case of the All Blacks getting away with something they very well shouldn’t have? We’ll let you decide.